NOTE: Some visitors to The UsuryFree Eye Opener have been asking for an update about "My Natural Healing Journey." I am progressing slowly with the various alternative and natural treatments that I am faithfully following. Perhaps the most exciting happening that has evolved over the past few months is the launch of "Healing Hunt Ottawa." 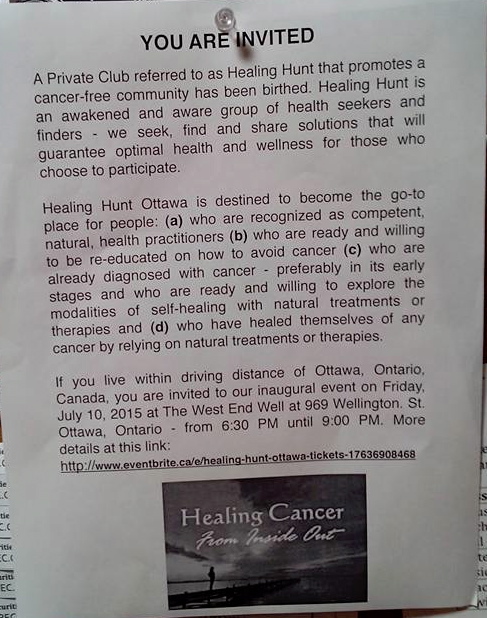 NOTE: This email is being sent to those who attended the inaugural event for Healing Hunt Ottawa at the West End Well on Friday, July 10, 2015 as well as to additional people. Please share with family, friends, working colleagues - anyone who may be seeking to achieve and maintain optimal health and wellness. Most readers are well aware by now that I have been healing an aggressive skin cancer labelled “parotid squamous cell carcinoma” with natural treatments/therapies, since I was diagnosed on February 20, 2015. For those not aware, more details at provided in these two updates. 2. My Project - My Natural Healing Journey - An Update! Healing Hunt Ottawa is a curation of the best skills, talents, products, services, etc. as offered by (a) health and wellness practitioners and (b) SDI (Self Directed Income) entrepreneurs and small to medium-sized retail outlets who are marketing quality health and wellness products. Discover what you can do to achieve and maintain optimal health and wellness. 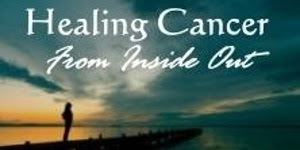 We at Healing Hunt Ottawa are dedicated to discovering those health and wellness practitioners whose unique skills and talents coupled with supporting resources that will (a) keep you healthy and cancer-free or (b) help you to regain optimal health and wellness after any cancer diagnosis. We gather sporadically for networking, discussions, demonstrations and healthy food and drinks. The plan is to bring together some of the best, natural health and wellness practitioners in the Ottawa area and introduce them to the growing number of people seeking alternative treatments/therapies rather than accepting the conventional treatments of “cut, burn, and poison” otherwise referred to as “surgery, radiation and chemotherapy” as now being offered by our conventional “sickness and disease” business. 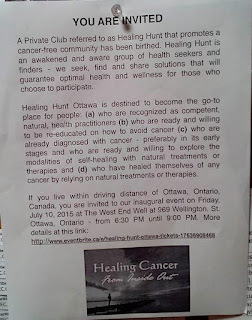 On Friday, July 10th, 2015, we held our inaugural event to introduce Healing Hunt Ottawa to the approximately 30 people who attended the meeting which was hosted at the West End Well, 969 Wellington St., Ottawa, Ontario. The West End Well is a community co-operative venture that opened in the fall of 2014, It has an organic food store, a restaurant and a space upstairs that can be rented for meetings - since I am a co-op member at the West End Well I reserved their room that holds approximately 30 people. Healing Hunt Ottawa expresses sincere gratitude and thanks to those approximately 30 people who attended this inaugural event and helped to make it a success. Healing Hunt Ottawa is grateful that the amount of donations covered the rental cost of the room at the West End Well. There were healers present who offered relevant information about healing any cancer diagnosis with natural therapies/treatments. There were people present who have already healed themselves of a specific, cancer diagnosis. And there were people present who were seeking resources and information about natural therapies/treatments. There was not enough time within the two hours allotted to permit everyone time to share their particular story. 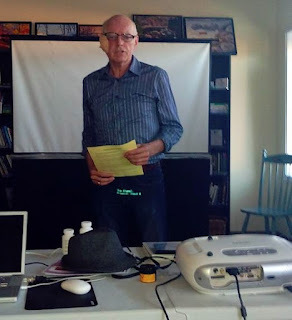 In this regard, I have had plenty of feedback from those who attended the inaugural event for Healing Hunt Ottawa - with words of appreciation and offers of good ideas to implement. One idea that has been suggested by a couple of people who attended is that Healing Hunt Ottawa be open to holding smaller events with 10-12 people (or less) - which could be scheduled sporadically (a) during the day or (b) in the evening. These events could be held in (a) people’s homes or (b) in small office boardrooms where FREE space is available or (c) sometimes local and independent coffee shops like to set aside a FREE space for a small group to gather and share information - in exchange the people who attend agree to purchase coffee, tea, and or a snack. 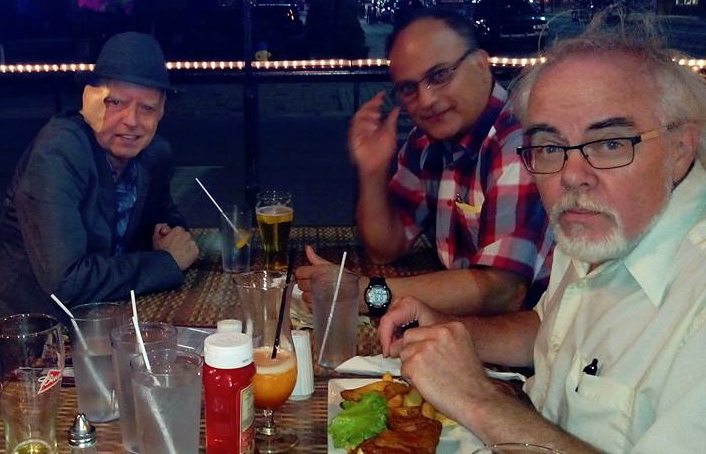 These smaller “chat” gatherings would be more informal and could be organized by any member of Healing Hunt Ottawa. Initiating this option will provide more opportunity for other people to learn about Healing Hunt Ottawa. Another suggestion was that Healing Hunt Ottawa hold a larger event - perhaps once or twice a month - where we could (a) invite guest speakers and/or (b) watch a video documentary that related to “health and wellness” and follow up with some discussion. Another suggestion is that Healing Hunt Ottawa assume a leadership role in facilitating connections between the various local healers as well as providing information and resources for people who are seeking alternatives to the conventional therapies - that are not working so very well. And yet another suggestion is that Healing Hunt Ottawa create and launch a usuryfree time currency that could be used as partial payment for (a) natural treatments (b) and/or for quality “health and wellness” products. This usuryfree time currency could be referred to as a “Healing Hour” - with a value equivalent to $12.00 (Canadian Funds) - for one hour of unskilled labour. Any professional would simply multiply by a number to find the calculation that fairly fits the value of the product or service in the conventional marketplace. Trades and/or exchanges could be negotiated using partial, usury-bearing federal dollars and partial usuryfree time currency. NOTE: This Healing Hunt Ottawa Event is another FREE event. However, donations will be gratefully accepted to cover promotional costs and rental fees. Donations can be made at the EventBrite link or on the evening of August 5, 2015.